check out Choreonoid.org opensource project. 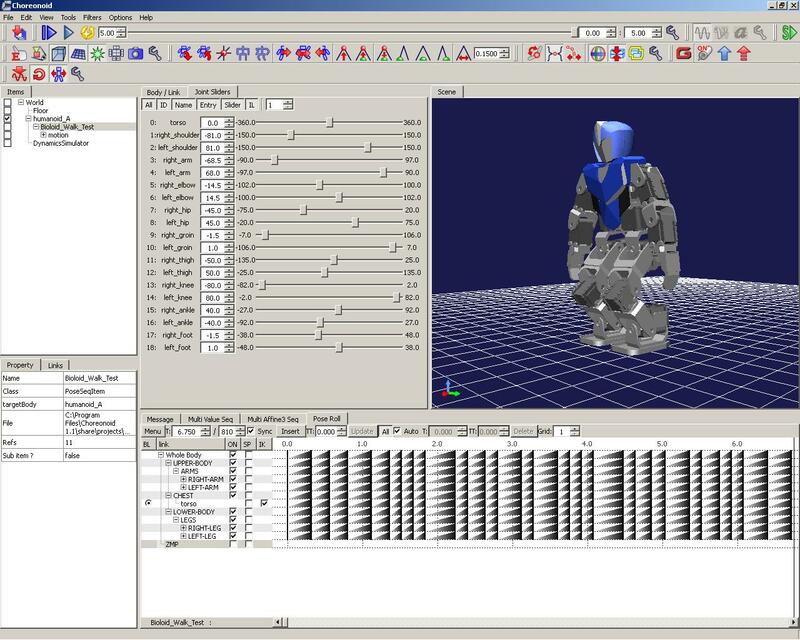 Great tool to design humanoid robot motions though currently only hobby robot it interfaces with is G-Robot (futaba). Very impressive!! can you please post the model so that maybe others can help integrate the motion generator with the actual robot ? I have no screen capture capability beyond single frames so no video yet. camstudio.org is actually pretty reasonable and is not full of adware. Just make sure to scroll down and download it from the sourceforge link. The first video is of my Bioloid model walking in Choreonoid. Here's a video of just the scene window. I used selected steps from Humanoid_A.mtn as keyframes to create the motion, so the movement should be close to what you see with the real robot.